With an iPod in hand, you’re ready to jump aboard a cross-country flight. Yet you’re stuck in the cheap seats, so you don’t have a power outlet, as the passengers at the front of the plane do. How can you keep your iPod continuously pumping out tunes, or help it last through enough video that you can avoid the in-flight movie? Charge ahead with these power-saving and battery-enhancement tips. You can’t fight physics. All batteries eventually lose their charge. However, there are things you can do to squeeze the most minutes of play time from your iPod. Put It on Hold Accidentally activating your iPod is easy if the play button rubs against something while it’s inside your pocket or bag. Unless you plan to use your iPod right away, engage the Hold switch so it doesn’t play when you’re not listening. Switch Off Nonessentials Your iPod’s backlighting, equalizer, and Sound Check features all consume power. You can’t avoid using backlighting when viewing pictures or video, but you don’t need it for listening to music. The equalizer (the tone controls built into the iPod) and Sound Check (a feature that attempts to make all music files play back at the same volume) also accelerate battery drain, though not to the same degree as backlighting. If you’ve added equalizer effects to songs in iTunes (by clicking on the Equalizer button at the bottom of the window and applying one of the settings), it’s easy to undo them on your iPod. Just navigate to Settings: EQ and choose Flat. This tells the iPod to ignore any equalizer settings your tracks might contain. While you’re in the Settings menu, make sure that Sound Check and Backlight Timer are both set to Off. Avoid Large Audio Files All iPods except the shuffle and the nano store files on a hard drive. To preserve battery life, the iPod spins up that drive, loads data into a 32MB SDRAM chip (the 60GB fifth-generation iPod is the only one with a 64MB chip), and then spins down the drive. With larger files—for instance, those encoded in the AIFF, WAV, or Apple Lossless format—the hard drive has to spin up more frequently, thus draining the battery more quickly. That’s why Apple recommends that you stick to playing files that are under 9MB. To create slim files, use iTunes’ AAC or MP3 encoder to rip CDs or convert uncompressed audio files. You can adjust these settings by going to iTunes: Preferences: Advanced: Importing and choosing an encoder from the Import Using pop-up menu. If you want to play long tracks—endless podcasts, for example—consider using an audio editor such as Apple’s GarageBand to split files into shorter segments. To do that, drag the track into GarageBand to import it and then move the playhead to the spot where you’d like to split it. Choose Edit: Split, select the second half of the track, and press Command-X to cut it. Select Share: Send Song To iTunes, which will save the remaining segment as an AIFF file in iTunes. (Later on, you can open iTunes and convert the files you created in GarageBand to AAC or MP3 format.) Next, delete the first part of the track (the one you just exported). Press Command-V to paste in the second part of your track, and export this as well. Bulked-Up Battery A higher-capacity replacement battery can add hours of music playing to an older iPod. Keep It Warm iPods run on lithium-ion batteries, which operate best at around room temperature. These batteries become less efficient when the temperature drops below 32 degrees Fahrenheit, so your iPod won’t play as long in those conditions. Cold weather won’t permanently damage the battery, though. Once it warms up, it should revert back to its usual performance. The same doesn’t hold true for an iPod in a hot climate. If you use or charge an iPod for an extended period at a temperature that exceeds 95 degrees Fahrenheit, you could permanently damage the battery and reduce the amount of time your iPod is able to play per charge. Keep It Charged Lithium-ion batteries perform better if you bump their little electrons around every so often. So even if you’ve purchased a newer iPod, you should still charge your older iPod once a month to keep its battery in good shape. You can also keep it stored in its cradle—there’s no danger of overcharging it. Use the Latest iPod Software Apple continues to work on increasing battery efficiency. As it finds ways to better battery life, it rolls those tweaks into its iPod software updates. By keeping your player up-to-date with the latest software, you could give your iPod a performance boost. Power Booster Though slightly bulky, an external lithium-ion battery pack will help your iPod power througßh the entire Lord of the Rings trilogy on a single charge. If you follow the first set of tips, your iPod’s battery life should closely match Apple’s specifications. But a transcontinental trip filled with music and video is likely to drain even the most robust iPod’s battery before you ever touch ground. What then? Add a Battery Pack On a nonstop flight from San Francisco to New York, you’ll find that your video-playing fifth-generation iPod gives up the ghost somewhere over Indianapolis. The easiest way to add hours to your iPod’s charge is to bring along an external battery pack. These packs plug into an iPod’s dock connector port and charge its internal battery. The most powerful ones feature rechargeable lithium-ion batteries of their own. 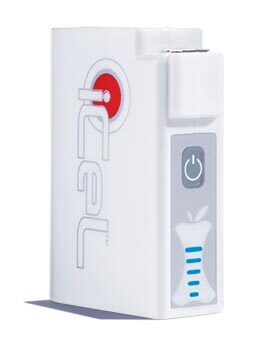 The $99 iCel 201, from Lithium House, provides around 50 hours of music or 10 hours of video playback on a fifth-generation iPod. BatteryGeek claims that its $150 GeekPod 100 lets your iPod play music for more than 100 hours, or play video for 12 hours, on a single charge. You can also purchase less-expensive packs that run on standard batteries (and therefore provide fewer hours of play). The $20 TuneJuice, from Griffin Technology, provides an additional 8 hours of music on a 9-volt battery, and the $50 Battery Pack for iPod with Dock Connector, from ( Belkin ), adds 15 hours on four AA batteries. 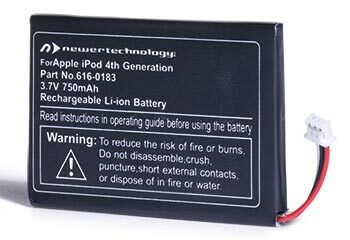 Replace the Battery If you have an iPod that’s out of warranty, consider installing a higher-capacity battery. The capacity of a battery is measured in milliamps (mAh). Companies such as Newer Technology and Sonnet Technologies sell replacements that have higher mAh ratings than the original iPod batteries. Get one of these, and you’ll up your iPod’s play time. How much? I replaced the 1,200mAh battery in my first-generation 5GB iPod with a $20 2,100mAh battery from Newer Technology. According to Apple, the original battery should last up to 10 hours per charge. With the Newer battery on board, my iPod played music continuously for 21 hours and 25 minutes. If you’re mechanically inclined, it’s fairly easy to replace the battery in a first- or second-generation iPod. But newer models are tougher nuts to crack. For instance, the iPod mini is particularly difficult to open. And the third-generation iPod includes a thin cable that’s attached to both the motherboard and a connector on the back plate; open this model the wrong way, and you could break the cable, which will destroy your iPod. For this reason, it’s safest to have a professional install your new battery. iPodResQ offers a battery-replacement service for $64, and Other World Computing (eshop.macsales.com) will install a Newer Technology battery for the price of the part plus a $39 service charge. Even if you follow our tips, you may find that your iPod’s battery behaves in unexpected ways. At that point, there may be little you can do. Here are a couple of common issues. Inaccurate Readout If your iPod’s battery meter goes from full to nearly empty in a short period of time, bear in mind that it’s providing an approximation. If you suddenly tax your iPod’s battery by, say, playing an episode of Lost , the meter will reflect how much battery life it thinks you have left based on your current usage. Fast Rundown If your iPod runs out of juice much quicker than it should, you probably have an ailing battery. The battery could be defective (you happened to get a bad one) or damaged (perhaps from being exposed to too much heat). Or it might be nearing the end of its life (iPod batteries should last for around 400 to 450 full charges). If your iPod is under warranty, take it to an Apple Store or visit the iPod Service Request site (depot.info.apple.com/ ipod)—the battery may be defective. If your iPod is out of warranty, Apple will replace the battery for $59. Other companies, such as Small Dog Electronics or the ones we mentioned earlier, can also replace the battery, sometimes for less money.